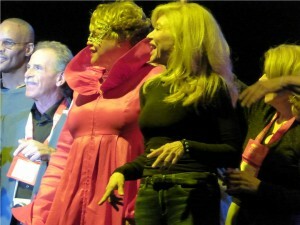 Photo blog of the Celebrity Equinox. Just back from a 10 night Caribbean cruise on the Celebrity Equinox cruise ship, my second cruise on this beautiful ship. 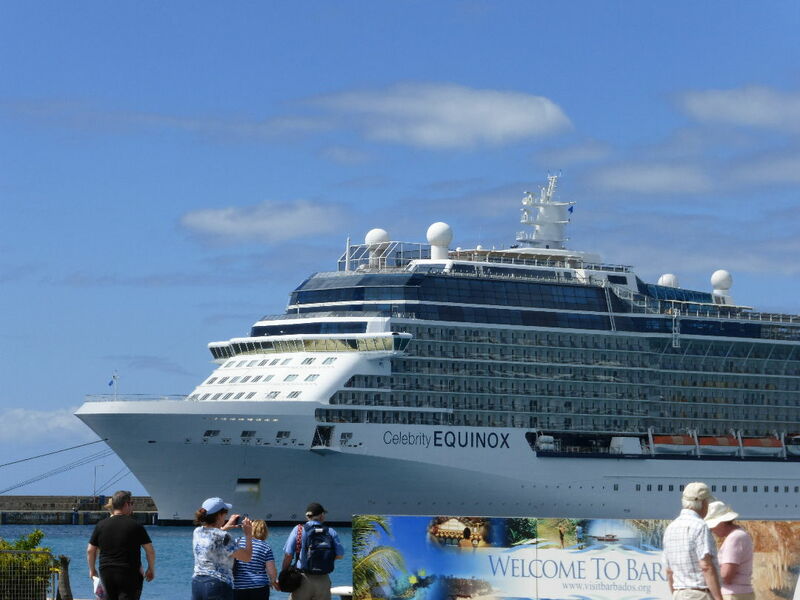 Just back from a 10 night Caribbean cruise on the Celebrity Equinox cruise ship, my second cruise on this beautiful ship. 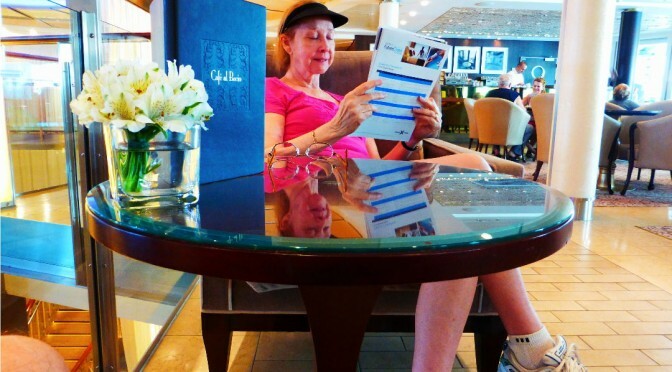 I have now taken 19 cruises and I think the Equinox is the best so far. 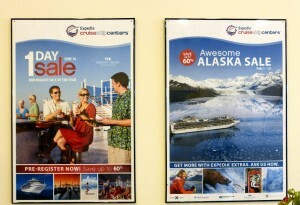 Here are some of my photos of the Celebrity Equinox cruise ship. The lawn club is amazing. 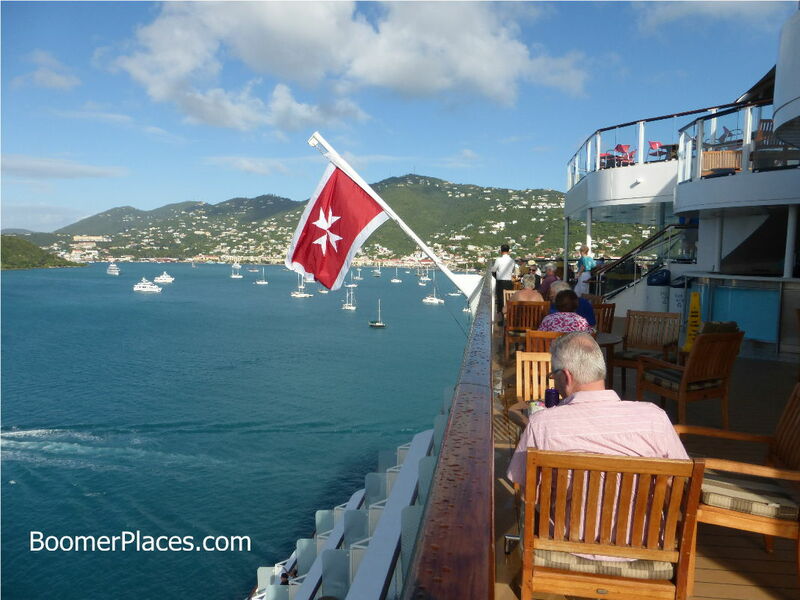 Up on the top of the ship are two large areas of real grass! We played bocce ball and was in a golf putting contest (which I won, see photo below). The lawn club area makes this ship and the other solstice class ships really unique. Well that is not all, right next to the Lawn Club is the Corning Glass Show. Given a couple of times a day while at sea, you have got to see this. True artisans at work. 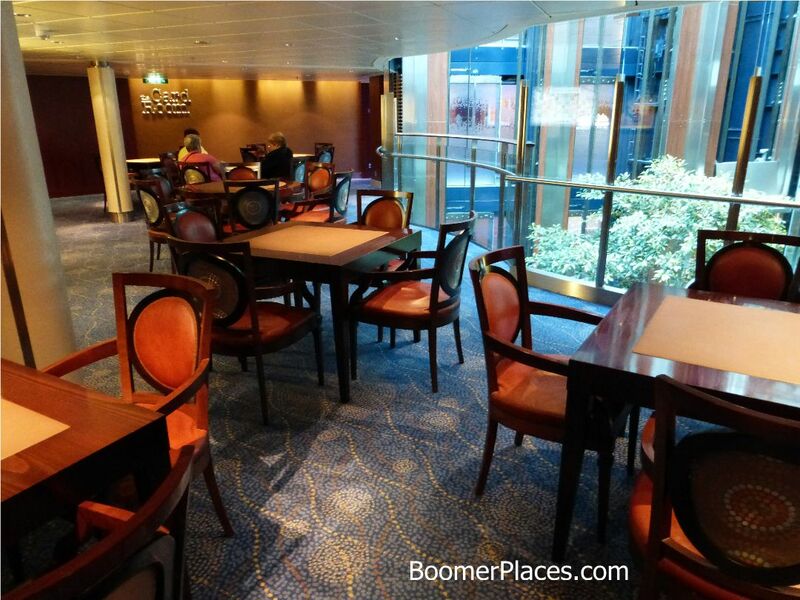 On the same level at the rear of the ship, there is a bar and sitting area. Up above you will the outside tables from the appropriately named Oceanview Cafe. This must have been St Thomas. There is always some activity going on in the many foyers of the Equinox. 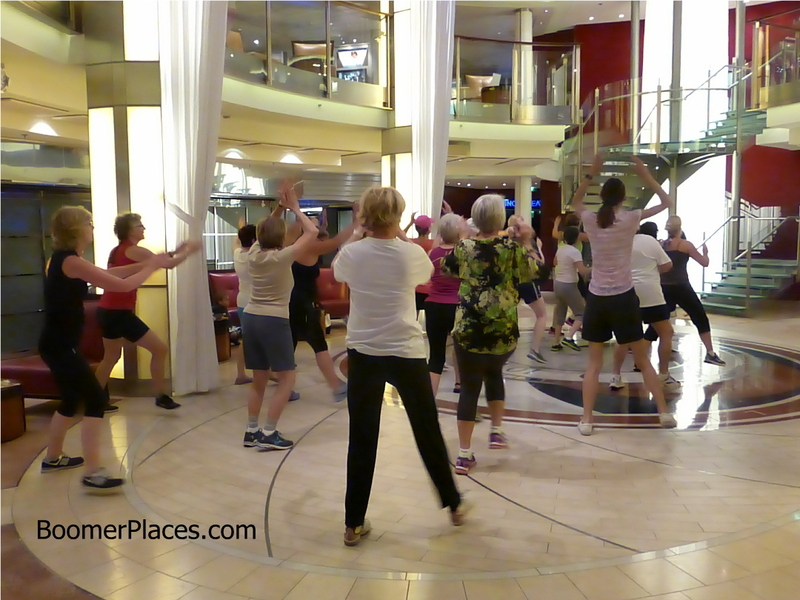 I believe this is some sort of dance exercise group. You don’t sign up, just show up. In the evenings there games here. 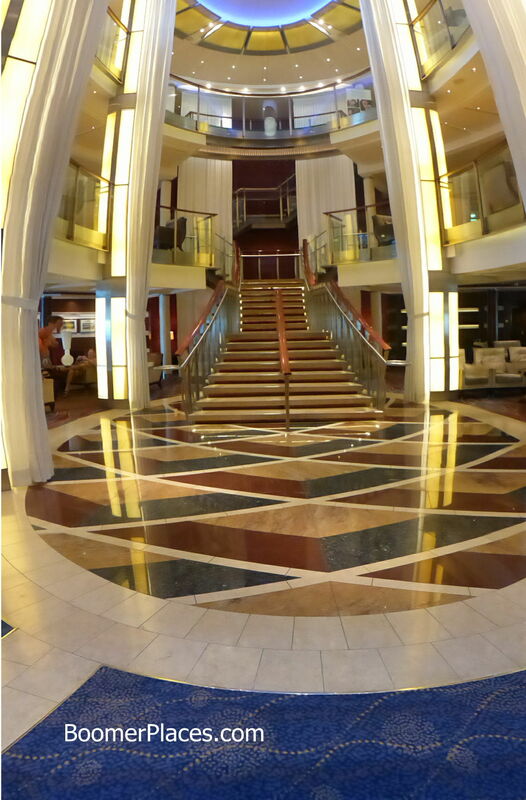 Speaking of foyers, this one below is the Grand Foyer on Deck 3. Part of this foyer is the elevator atrium that shows four glass elevators as they go all the way to the top of the ship. Quite a sight. 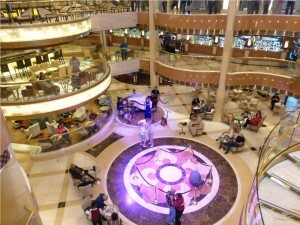 In the Grand Foyer there is always something going on, like dance classes, demonstrations, formal dancing, and mini “interactive” shows by the ship’s entertainment cast. 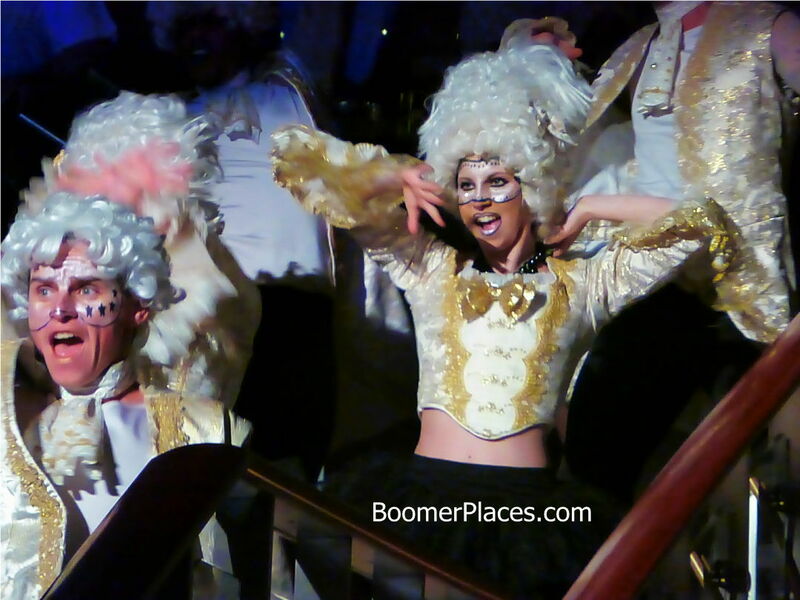 One evening the cast came down the stairs of the Grand Foyer and gave a mini show which turned into a dance party. It was wild! 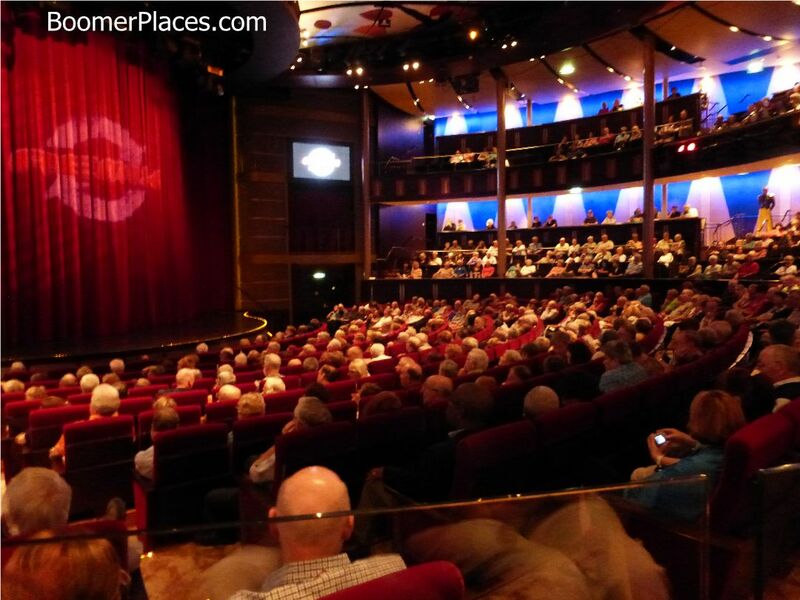 The main entertainment area is the Princess Theater where two shows a night are staged. I liked this theater because there were no chairs and tables to bang around and camp your sitting. Comfortable and every seat is a good seat, even in the balcony. On a returning sea day there is a great brunch from 10am to 2pm. Do not miss this, it is excellent. 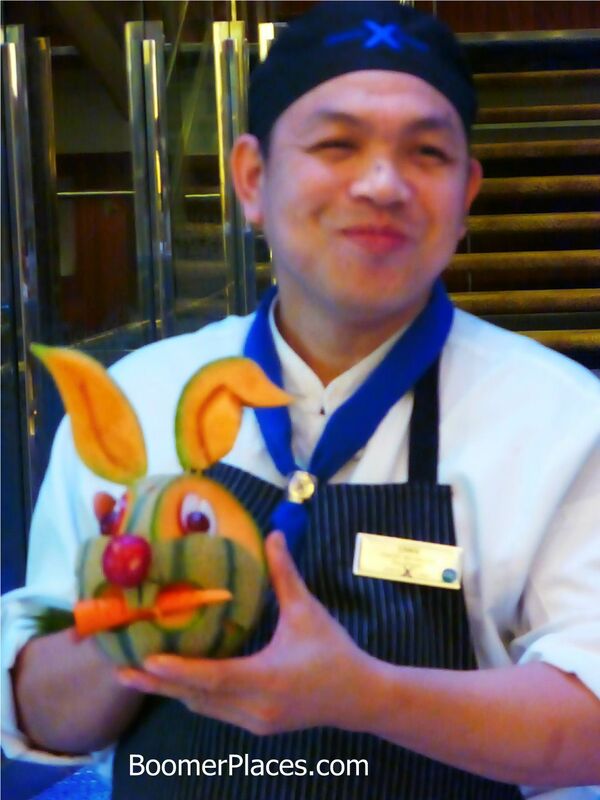 One reason not to miss the brunch is the beautiful original food and ice carvings. Bring your camera like I did. 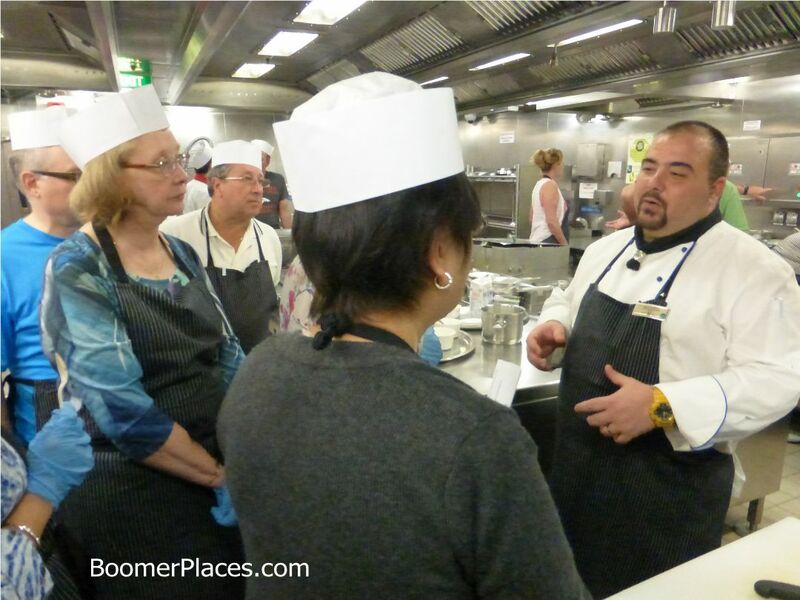 By the way, we took a cooking class at the Murano Specialty restaurant and really enjoyed it. You get a great meal with the package. You have to ask the restaurant about this as I don’t think it is advertised. 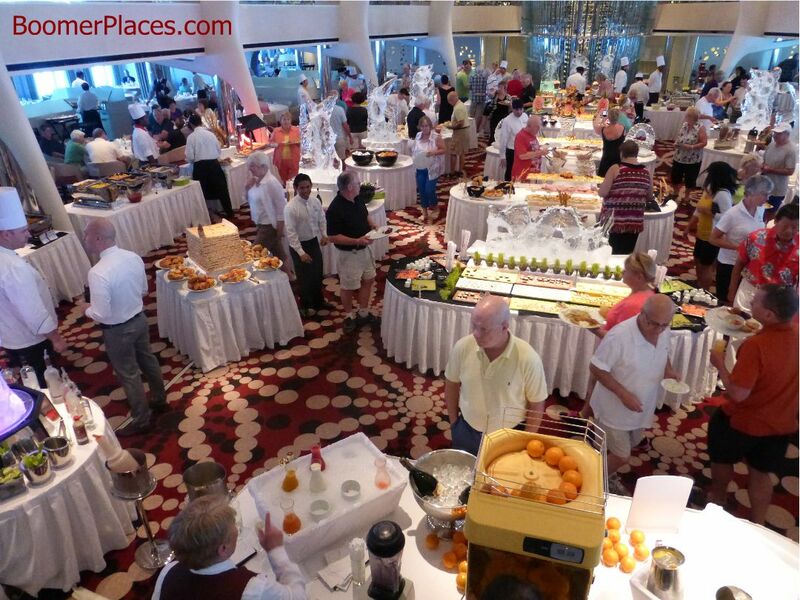 Of course on a Caribbean cruise the pool area is very popular. 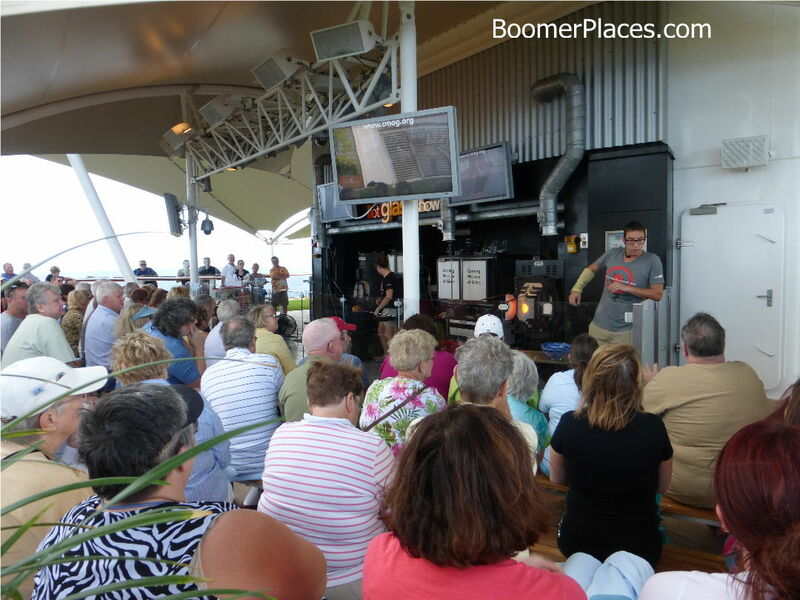 Entertainment stage, hamburger and hotdog grill and bar right there too. 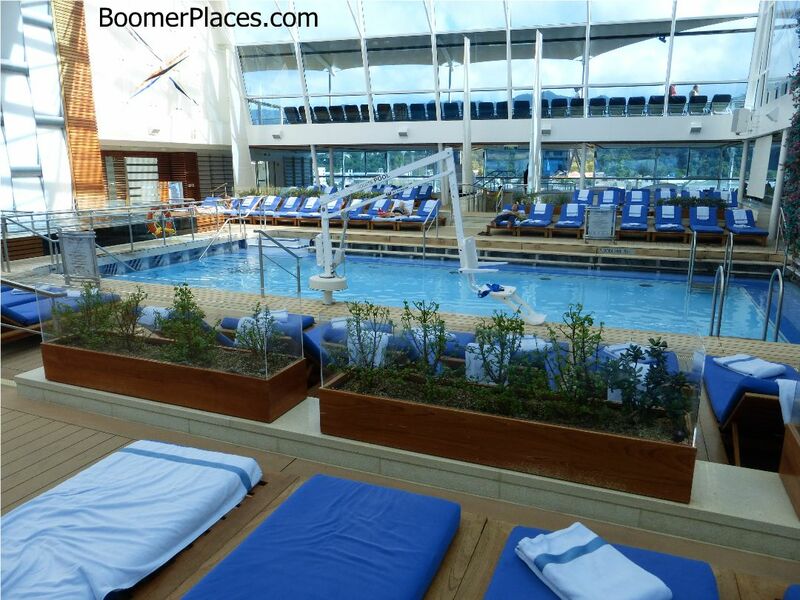 But we liked the Adult Pool in the Solarium. This little cafe is also in the solarium. 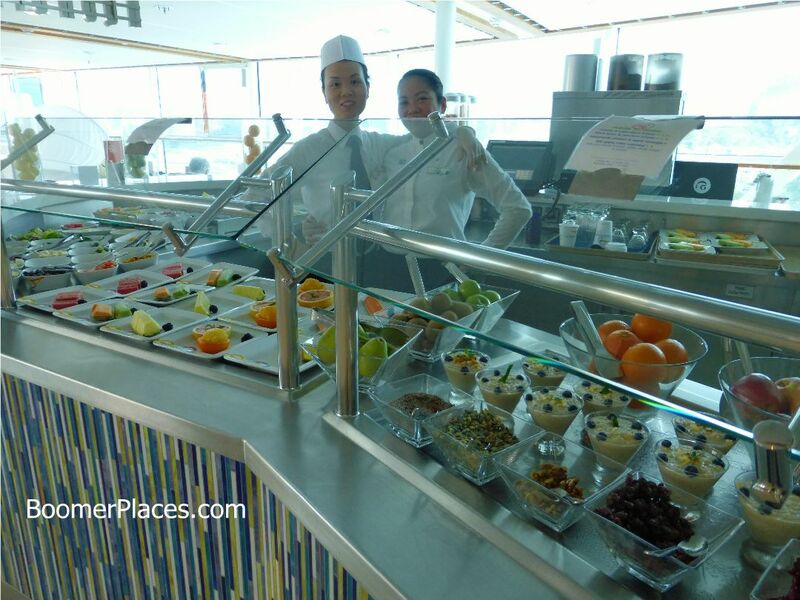 They serve healthy food and have fresh fruit drinks and smoothies which we like. Well there are many more attractive places on the Celebrity Equinox but this should give you an impression of this beautiful ship. Oh, I better let you see the outside of the Equinox. Thanks for a great look at life on the Equinox. 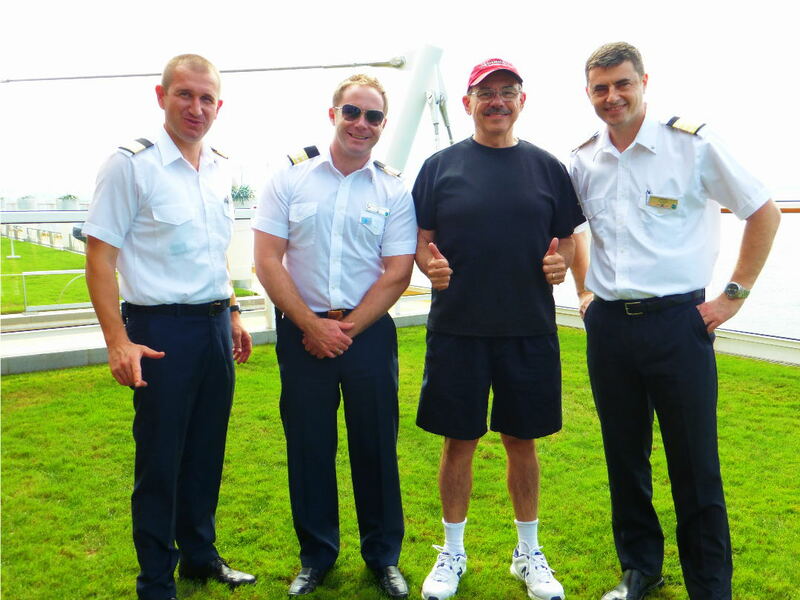 These features are very useful for people thinking of doing a cruise on a particular ship. 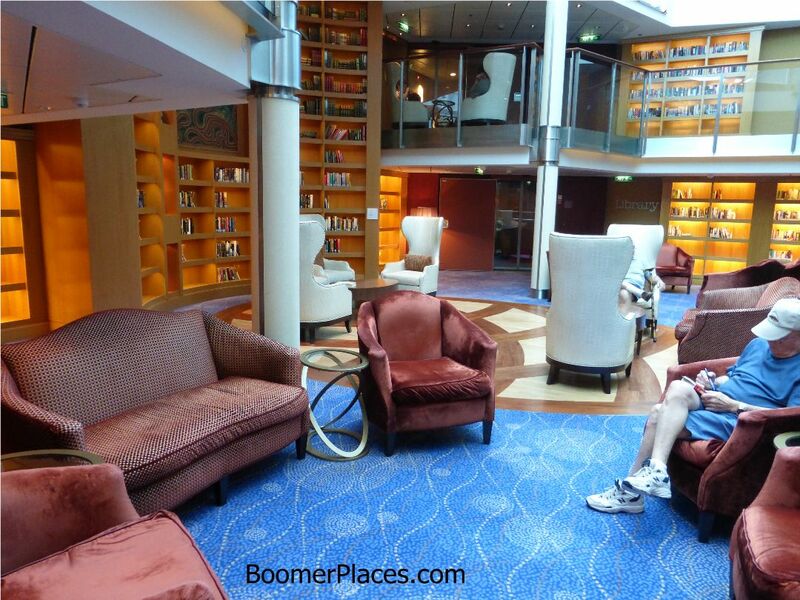 I like the way you managed to catch some of the activities on the ship as well as the décor and features. Holy Cow! This is bigger then the hotel that I stayed in… well not really but incredible for a ship. I have my first cruise booked and I am super excited. I will have to add this one to my bucket list as well. I can understand why you enjoy it so much, who wouldn’t. I would have a hard time leaving! Wow..!! its very nice post and also good your photo collection. 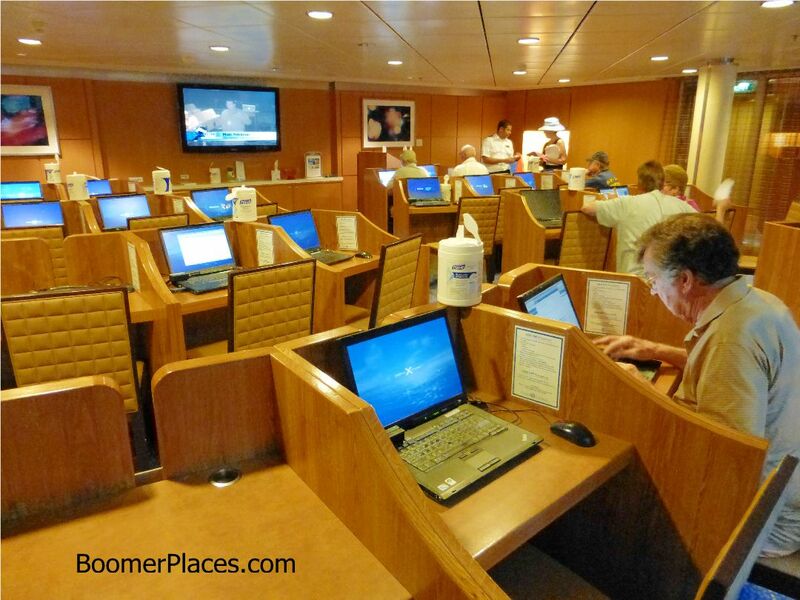 I like the 24 hour computer room & Adult Pool in the Solarium. I can’t even begin to tell you how tantalizing that sounds! Ah, to relax by the pool and not have to figure out what in the world to throw together for dinner. Sounds absolutely exquisite! Excellent..!! a very amazing post with fantastic photo collections. Amazing cruise ship, it’s so huge and amazing it has everything, would be nice to cruise on. Thanks for this great post.